Names, facts and figures about the port areas on the Kiel Fjord. The PORT OF KIEL consists of the city ports (Schwedenkai, Sartorikai, Ostseekai and Norwegenkai), the Ostuferhafen, the canal ports (Scheerhafen and Nordhafen) as well as KIEL AIRPORT. The largest coherent part of the port is situated on the east bank of the Kiel Fjord. This is where the ferry lines to Northern Sweden, Russia and to the Baltic States are concentrated. The city port is characterised by the ferries of the liner services to Scandinavia and the cruise ships. The Nordhafen and Scheerhafen and KIEL AIRPORT are located on the Kiel Canal. Here you can find Directions how to get to the Terminals. Daily departures to Gothenburg with the big RoPax ferries of Stena Line departing from Schwedenkai offer ideal opportunities. The target markets in Scandinaiva are reached overnight. Short distances on the terminal to any other mode of transport as well as the separation of pasenger and cargo handling create optimum conditions. The direct rail link enables transhipment of cargo from rail to ship. The Norwegenkai ranks among the best terminal facilities on the German coast. This is where Color Line heads off to Oslo on a daily basis and consitutes the only direct ferry connection from Germany to Norway. The terminal offers an efficient structure with short distances to all other modes of transport with direct rail connection and separated passenger and cargo facilities. 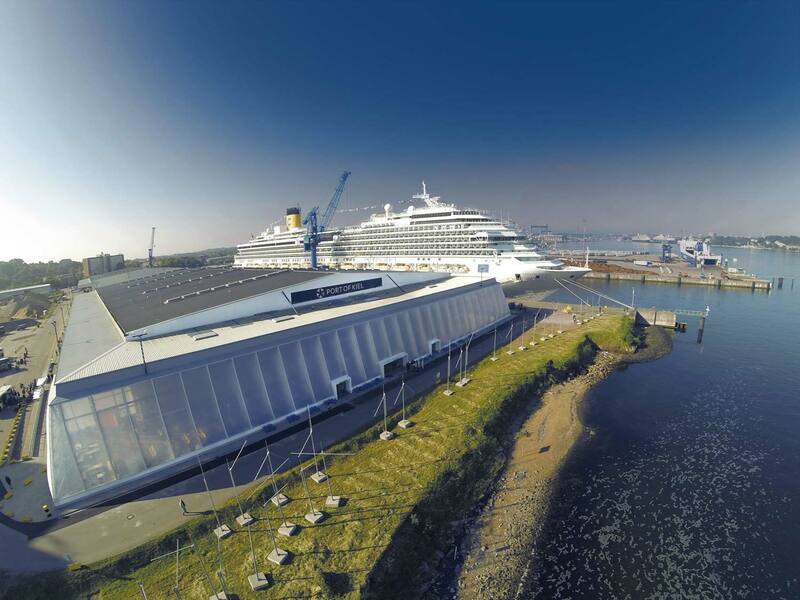 The high-performace Cruise Terminal Ostseekai in the heart of the city center ranks among the most modern cruise terminals on the German coast. 600,000 passengers begin or end their cruise here every year. It has been designed for the high requirements of today's cruise ships and their guests. On 5,000 sqm you will find bright and modern check-in facilities with comfortable waiting areas and efficient luggange handling. In 2019, a second terminal of 3,700 sqm will be taken into operation. This new Cruise Berth No. 1 was opened in June 2014. The outdoor area, the baggage claim and the modern and light-flooded passenger terminal with a view over the Kiel Fjord offer enough space for handling large ships. Best nautical and operational conditions. The Ostuferhafen is the freight and logistics centre on the Kiel Fjord. It is the biggest part of the PORT OF KIEL and it is where the ferry lines to the Baltic States, West Sweden and Russia are located. With six berths, LoLo and RoRo facilities as well as an intermodal terminal, the Ostuferhafen offers the option of trimodal handling with outdoor storage areas, warehouses and service buildings. The Nordhafen, situated near the locks of Holtenau, is a maritime commercial area. The trimodal facility is located perfectly for all modes of transport. The direct link to the national highways (Autobahn) and rail network are two of the locational advantages. Being located directly on the Kiel Canal offers seamless accessibility to barges and seagoing vessels. The Scheerhafen is located in Kiel-Wik at the entrance to the Kiel Canal which is the most frequented artificial waterway in the world. The facilities are used for handling construction material and are ideal for handling self-unloading bulk carriers. KIEL AIRPORT is managed by PORT OF KIEL and is the regional airport of the state capital. The area offers versatile development opportunities and the unique atmosphere of an airport with a view of the Kiel Fjord. It is located less than 15 minutes away from the city port terminals and offers the perfect symbiosis of air and sea transport. Services: Maintenance, repair, overhaul, helicopter flights and sightseeing flights, charter flights, flight school, sky diving, gliding, restaurant, Port Parking.